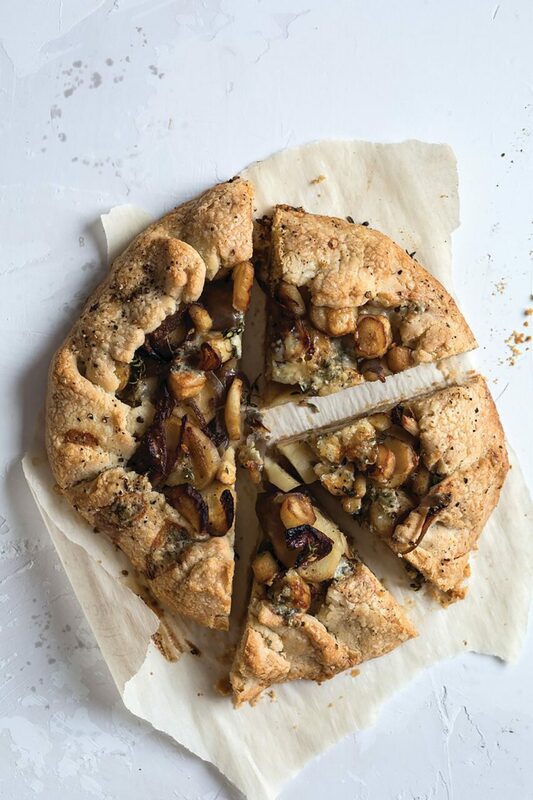 Rustic and elegant, this beautiful gluten friendly dish wows with complementary flavors of slightly sweet parsnip, rich caramelized red onion, and tangy blue cheese with a buttery-flaky, almond-kissed crust. Make the dough: In a food processor, add the rice flour, almond flour, potato starch, and salt and pulse. Add the diced butter and pulse until the butter is the size of peas and the mixture resembles a sandy dough (pulse about 12 times). Add the cold water and pulse until the water is incorporated. Form the dough into a disk, wrap with plastic wrap, and refrigerate for at least 30 minutes. Make the filling: In a large sauté pan over medium-high heat, warm the olive oil. Add the onion and 1/2 teaspoon salt and cook until soft and slightly caramelized, about 7 minutes. Add the parsnips and another ½ teaspoon salt. Cook until the parsnips are al dente, 3 to 5 minutes longer. Remove from the heat. Preheat the oven to 400°F. Lay a sheet of parchment paper on a clean work surface and dust it with rice flour. Place the dough on the paper, dust a rolling pin, then roll the dough into a circle about 10 inches in diameter. Transfer the dough on its parchment to a baking sheet. Decoratively arrange the onion-parsnip mixture in the center of the dough, leaving a 2-inch dough border around the perimeter. Season the vegetables with salt and sprinkle with thyme and blue cheese. Fold the 2-inch dough edges inward, over the filling edges. Refrigerate the tart on the baking sheet for at least 15 minutes. Brush the pastry edges with the heavy cream. Sprinkle a bit of pepper over the edges. Bake the tart until golden brown, 40 to 45 minutes. Serve immediately.